The tragedy at Langtang is a prism that reflects the risks and pressures experienced more broadly by mountain communities across Nepal. 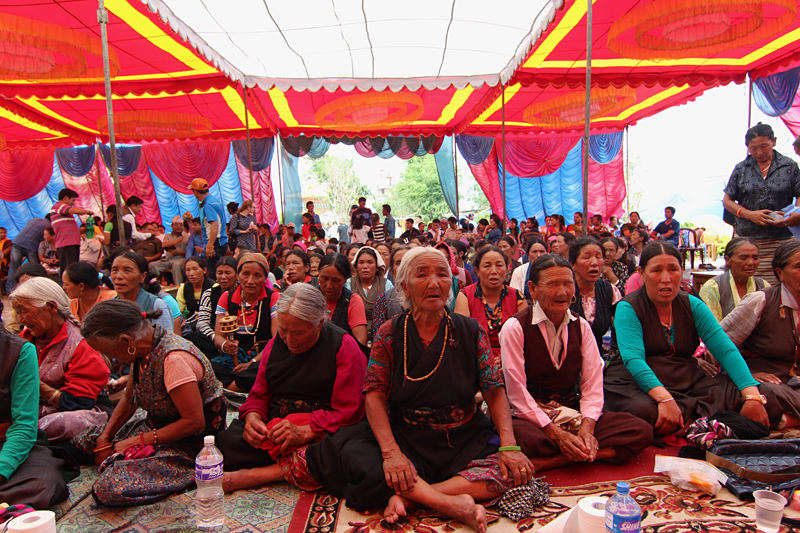 Forty-nine days after the earthquake, the Langtang community gathers at the Langtang internally displaced persons (IDP) Camp in Kathmandu for a ghewa ceremony, to honor and guide the souls of those who died in the Langtang Valley, on the eve of their reincarnation. June 12th, 2015. Photo by Austin Lord. Some forty-nine days after the earthquake of April 25, the people of the Langtang Valley gathered for a ghewa ceremony, the Tibetan Buddhist funerary practice that helps accumulate virtue to guide the souls of the deceased during the process of reincarnation. Inside the monastery 176 statues, each representing someone from the Langtang Valley who died during the earthquake, were wrapped with scarves while photographs of the deceased were ceremonially burned. Outside the monastery, the men and women of the Langtang community—most of whom had been camped at Yellow Gomba in Swayambhunath since they were evacuated to Kathmandu—sang and prayed, surrounded by people who had come to support them. Today, the displaced people of Langtang are engaged in a simultaneous process of remembering and forgetting: their own suffering and the dream of returning to their ancestral home is deferred for a day, yet woven into the process of honoring the souls being reborn. Sweating in the inescapable heat of Kathmandu in June, they united in their grief to overcome the trauma that continues to shape their lives. As the souls of their loved ones left one state of existence and moved to another, the mourners told stories so as to let them go. 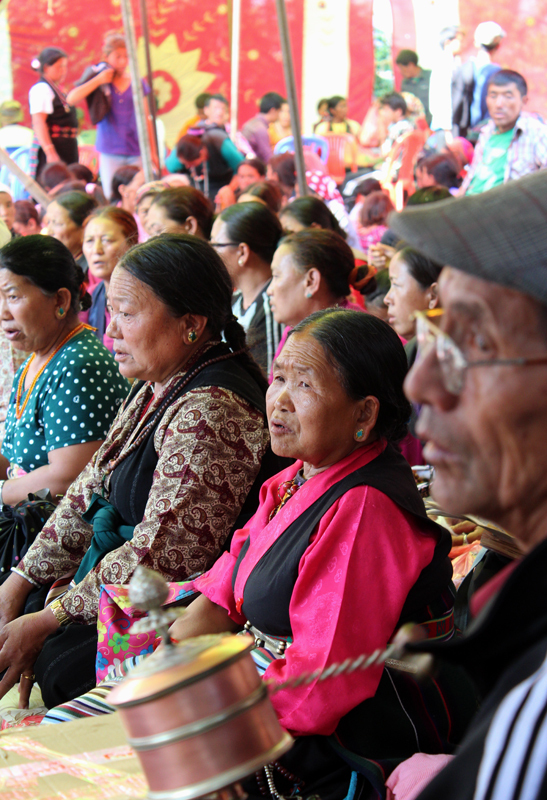 Elders from the Langtang community sing and pray during a ghewa ceremony, meant to accumulate virtue for the souls of those who died in the Langtang Valley. June 12th, 2015. Photo by Austin Lord. On the night before the earthquake, I witnessed another ghewa ceremony in a much smaller monastery just below the village of Langtang, where hundreds of people from the Langtang Valley had converged to honor an elder who had died. Local lamas led the ceremonies inside the painted walls, while young people took the opportunity to socialize outside. The rhythm of chanting, mixed with laughter, was punctuated by the bell and the drum as people sang and circled throughout the night. I drank chang and made new friends, explained the significance of the ceremony to my parents (who were visiting me), and then walked back to our guesthouse in Langtang, where we slept soundly. The next day, we awoke late and ate breakfast, chatting with our hosts until we departed just after 9 a.m. Less than three hours later, the earthquake began and the world changed. The earth pitched and swayed as the walls of the Langtang Valley collapsed inward, raining rocks and debris from thousands of meters above, even as a massive avalanche swept the southern slopes of Langtang Lirung. Looking back up the path I had just traveled, I realized that the entire village of Langtang, the monastery, and most of the people assembled the night before were gone. 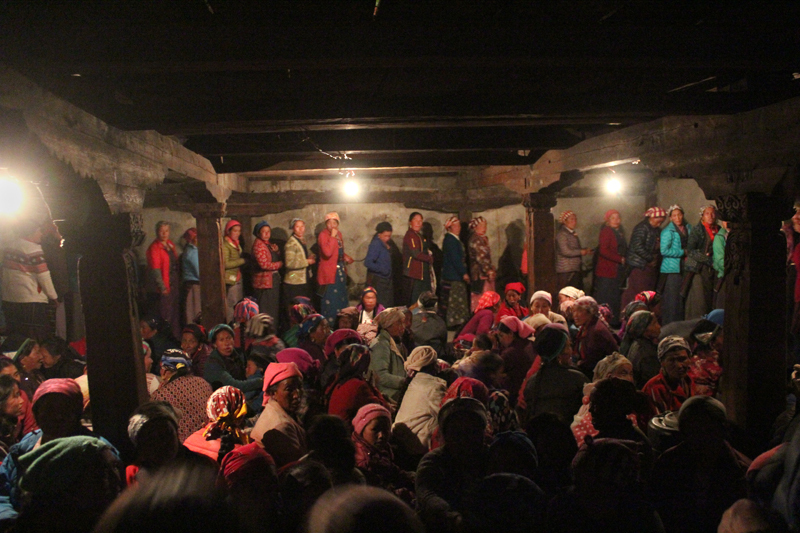 The night before the earthquake, the Langtangpa gather in the Langtang Gomba for a ghewa ceremony held for an elder who passed. April 24th, 2015. Photo by Austin Lord. 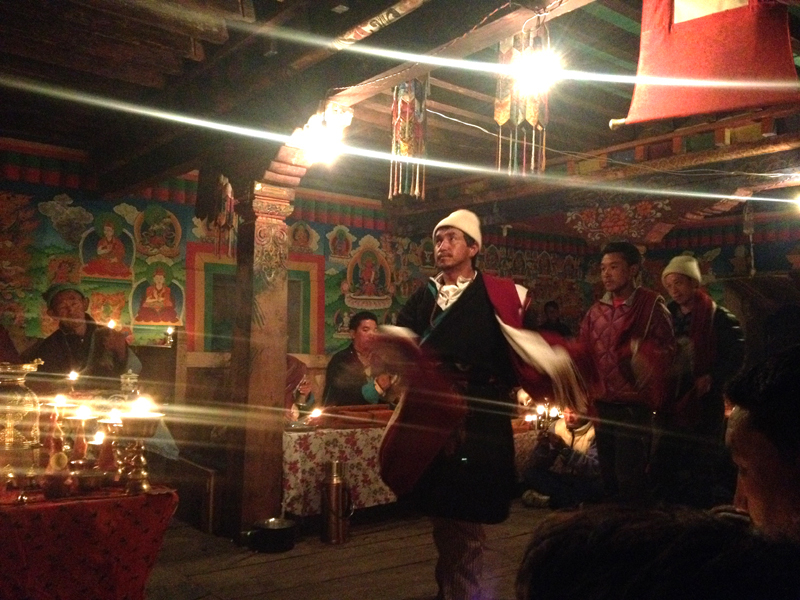 The night before the earthquake, the Langtangpa sing and dance throughout the night in the Langtang Gomba during a ghewa ceremony held for an elder who passed. April 24th, 2015. Photo by Austin Lord. 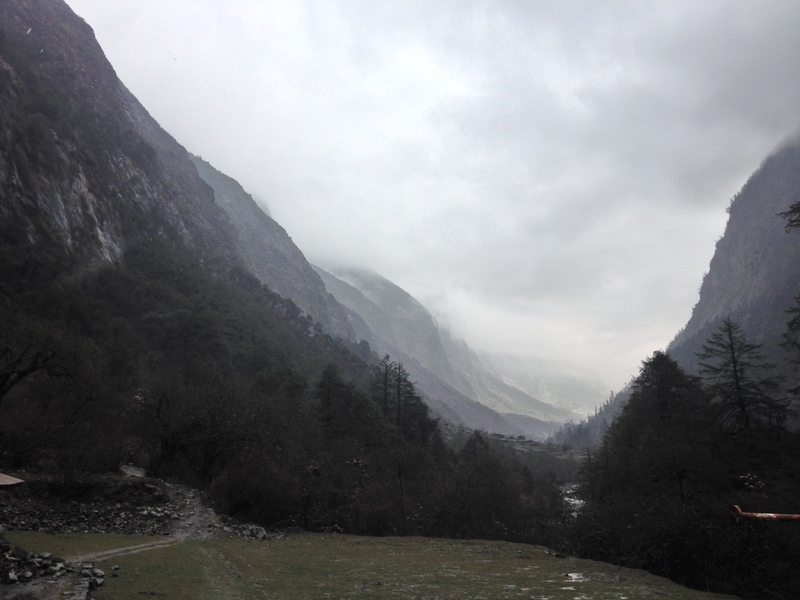 Looking up the valley toward the avalanche that buried the village of Langtang just hours after the author left. April 25th, 2015. Photo by Austin Lord. The tragedy at Langtang is a prism that reflects the risks and pressures experienced more broadly by mountain communities across Nepal. These dangers combine geophysical and social threats: spatial remoteness, geomorphic and seismic risk, socioeconomic precarity, limited political representation, and climactic volatility. Yet, with all due regard for the suffering of other Nepalis in other places, the dimensions of the disaster in Langtang are different than those in the rest of post-earthquake Nepal. The destruction and the loss of life are more concentrated, the scale of displacement is greater, and ongoing uncertainties are more pronounced.1 When the people of Langtang say “sabai gayo” (it is all gone) this is no exaggeration—the entire village was erased. Further, when Langtangpas talk about resettlement, they express a desire for something entirely different from what many elsewhere in the country seek. They do not wish to be relocated to a new and safer place, but instead to return to the Langtang Valley. 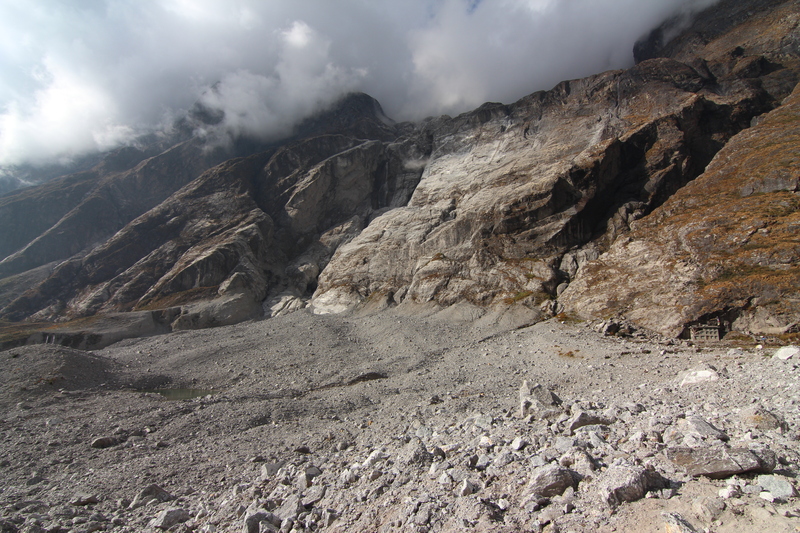 The avalanche zone at Langtang, almost a mile wide. Even months after the event, ice remains beneath the debris and nearly seventy bodies have yet to be recovered. October 2015. Photo by Austin Lord. 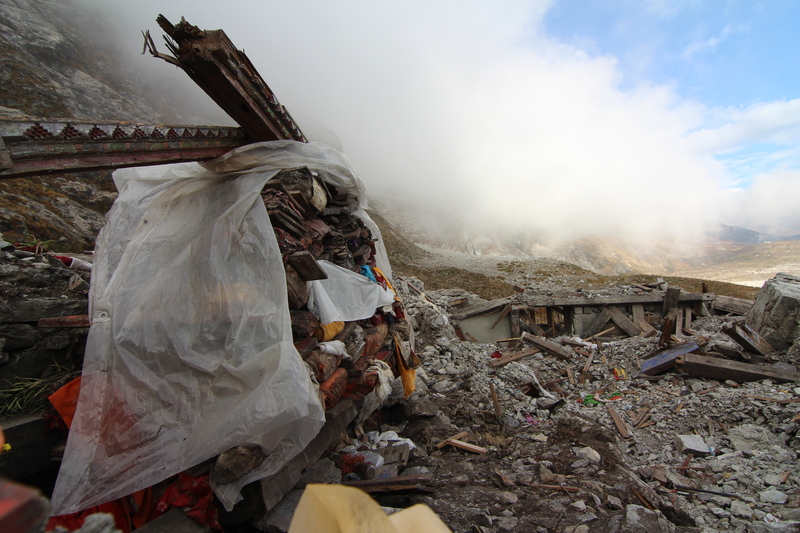 All that remains of the Langtang Gomba, which was destroyed by the earthquake, rockfall, and a 300mph shock wave created by the avalanche where the village of Langtang used to be; nearly seventy bodies have yet to be recovered even months after the event. October 2015. Photo by Austin Lord. 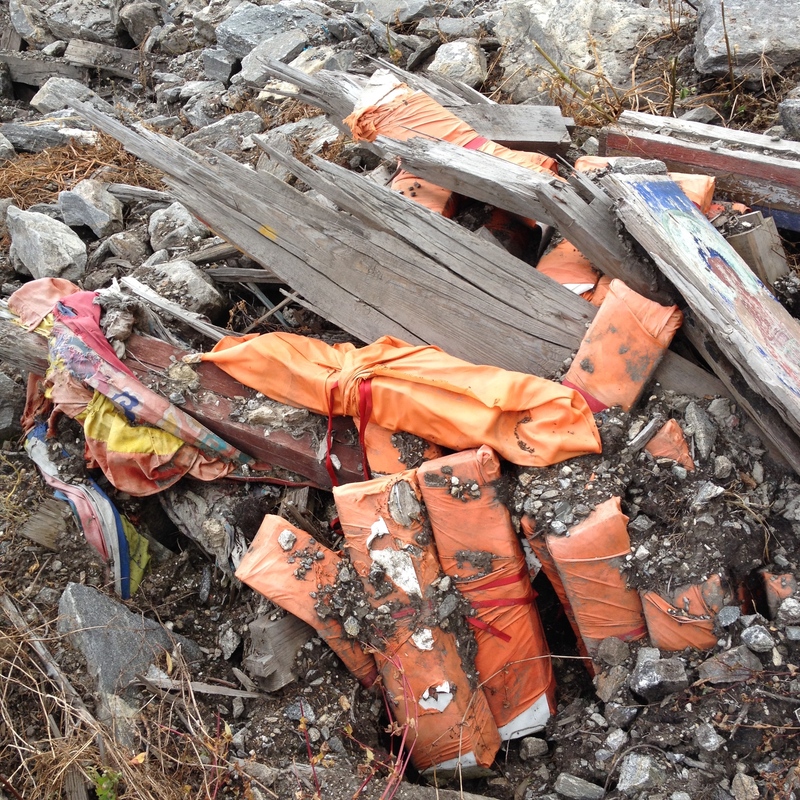 Tibetan-Buddhist scriptures amid the rubble of the Langtang Gomba, where the author attended a ghewa ceremony on April 24th, the night before the earthquake. October 2015. Photo by Austin Lord. Sequestered in Kathmandu, the people of Langtang meet daily to discuss what to do—a swirling conversation structured by trauma, confusion, grief, community tensions, and the uncertainties of the imminent monsoon. They have elected a Langtang Disaster Management and Reconstruction Committee, which is struggling to formulate plans for resettlement and trying to raise funds for reconstruction, while mobilizing to achieve recognition from the Government of Nepal. Community leaders have traveled to the Langtang Valley with Nepal’s military, foreign search and rescue personnel, filmmakers, and glacial geomorphologists, attempting to gather information about what remains of their home. In early June, a group of forty locals walked up into the crumbling valley to recover bodies and valuables from the avalanche site; they found little and returned shaken by continuing avalanches and landslides. Despite formal warnings of instability, a small group of elders and yak herders recently climbed back up to four thousand meters to continue the seasonal rhythms that have persisted for centuries. Others follow. Old men and women tell us that they will die in Kathmandu due to the heat, and that they would rather die in a landslide above than stay below in Kathmandu. Relief organizations and volunteers pulse in and out of the Langtang internally displaced persons (IDP) camp, international media bring cameras to capture a spectacle, politicians arrive to perform the act of listening, and the Langtang Youth Club circulates their own images and stories widely on social media. The tremors continue beneath them in Kathmandu. The world watches; they are posed with more and more questions, but no answers. 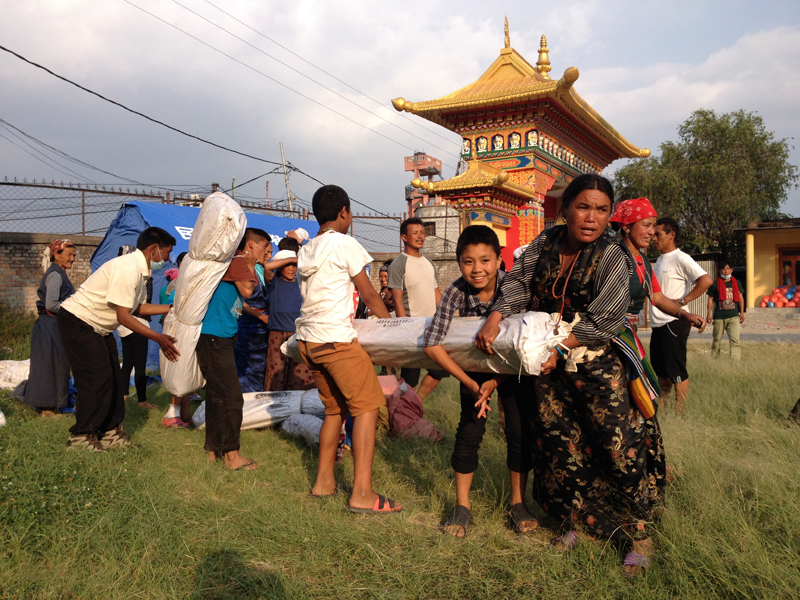 Survivors from Langtang community collecting relief materials to build temporary shelters at their IDP Camp at Phuntsok Choeling Monastery in Kathmandu, May 2015. Photo by Austin Lord. Still, this is not only a narrative of trauma. Everyday life is punctuated by orality and remembrance of all kinds: debates about the how and why of disaster response, horrifying details of destruction that have become commonplace, stories about loved ones lost, and histories that link the plastic landscape of the IDP camp to the beyul (sacred valley) they have left behind. The people of Langtang are incredibly strong. They maintain their dignity despite overwhelming circumstances, struggle for self-determination, imagine the future in their own terms, and move forward within the cycle of death and rebirth. As the candles burn in the monastery, new prayers are formed and scattered in circular time, the voices of the women echo on June 13 as they did on April 24, and the ghewa ceremony continues anew, helping lost souls find their way and radiating virtue out into the living world. Slowly they rise.’. It is estimated that 308 people died in the Langtang Valley: 176 Langtangpas, roughly 50 foreign nationals and an uncounted number of Nepalis from other areas who were working as porters and guides. The total number of deaths in Langtang remains unknown, as bodies are being excavated and many are still missing, even months later. *Austin Lord is an anthropologist and visual ethnographer who has been living and working in Nepal since 2012. He remains heavily invested in post-earthquake relief and recovery efforts as the Lead Coordinator of a volunteer organization called Rasuwa Relief and as a formal advisor to the Langtang Management and Reconstruction Committee. In the coming months, he will be engaged in a project focused on the creation of a Langtang Archive to help preserve the cultural heritage of the Langtangpa, and a “Memory Center” in the Langtang Valley to honor those who lost their lives there. Austin’s long-term research project focuses on the making of Nepal’s unique hydropower future, the political ecology of Himalayan hydropower development, and shifting patterns of mobility within ‘project-affected populations’. Austin holds a Master of Environmental Science from Yale University, was a 2014-2015 Fulbright Scholar in Nepal, and will pursue his doctoral studies in the Department of Anthropology at Cornell University. More of his photographic work can be found here. ← ¿Puede Gudynas salvarse del colonialismo simpático? My heart goes out to everyone caught up in those awful events.